Attendees at the Belair Community Centre. 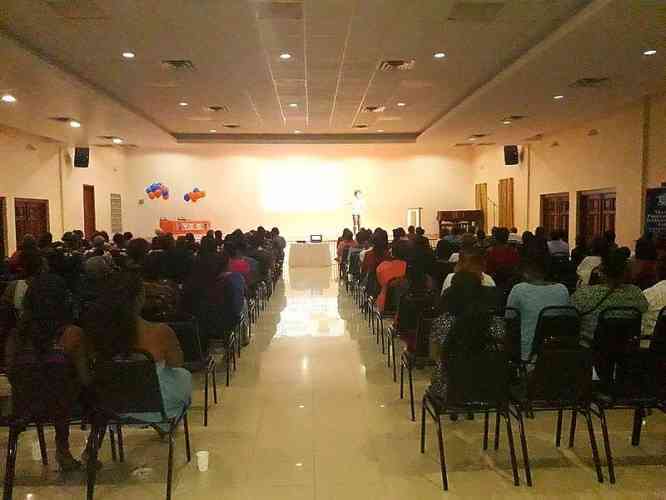 PHILIPSBURG–Youth Empowered for Success (YES) Foundation sponsored a free event for the community titled “Queens, You Deserve the Whole Loaf” at Belair Community Centre on Wednesday evening. The event drew hundreds of women, teenagers and even men. Natasha Gittens was the motivational speaker for the evening. She is recognised as one of the top motivational speakers in the Caribbean, according to a press release from YES Foundation on Thursday. Her voice captivated the diverse audience and kept them at the edge of their seats. “Her ability to be powerful yet sensitive allows her to pull at the heartstrings of both women and men. Her art of delivery is comforting yet direct, so audiences feel her compassion but take away serious messages. “It was apparent that many women understood her messages, as comments like ‘Tell it,’ ‘Yes, my dear’ and laughter became a part of the room’s ambiance. There were other moments when the room became still and it was clear that the event triggered individuals to seriously examine matters that were heavy on their hearts and minds,” stated the release. YES Foundation said it is committed to St. Maarten’s youth and will continue to develop opportunities to foster positive change and professional development. “We would like to thank our 2017 Foundation donors for making this event possible: N.V. GEBE and Windward Island Bank, in addition to our event sponsors Training Professionals International (TPI) Firm, 101.5FM Smart Conversation Talk Show and Customer Service Mobile Academy (CSMA),” concluded the foundation on Wednesday.